"Her eyes never forget." Netflix has unveiled the powerful first official trailer for Angelina Jolie's new film, titled First They Killed My Father, which will premiere at the Toronto Film Festival just before it hits theaters/Netflix. 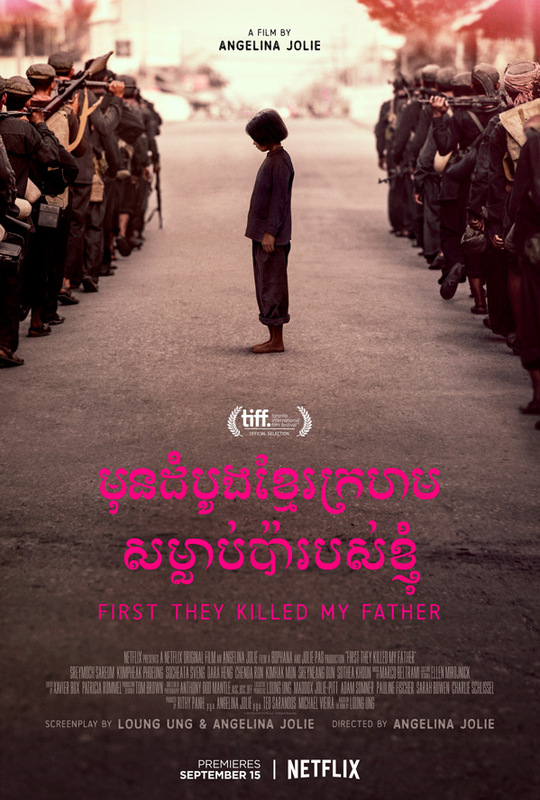 The full-length title for the film is First They Killed My Father: A Daughter of Cambodia Remembers, based on the book written by Loung Ung, who also co-wrote the script with Jolie. The film tells the story of the deadly Khmer Rouge regime in Cambodia, which was the corrupt Communist Party that lead the Cambodian genocide. The authentic cast includes Sareum Srey Moch, Phoeung Kompheak, and Sveng Socheata. It's actually very impressive that Jolie has decided to tell this story, using a local cast, and diving fully into this horrific story in Cambodia's history. Looks like it could be good. Give this a watch.